Digiscoping is the practice of attaching an optical telescope, monocular or spotting scope to a digital camera to take high-quality pictures at magnifications the camera cannot handle on its own. While you might think that this may run you hundreds of dollars, as camera zoom lenses often do, you can save a lot of money by investing in a spotting scope that is digiscoping-ready. If you’re new to these products, don’t worry if you feel a bit overwhelmed. There are a ton of models out there, and it’s not always easy to tell which are good deals and which are junk. We’ve done the hard work for you, creating this list of reviews of the best spotting scopes for digiscoping, so that you don’t have to search high and low for the model that is right for you. The Celestron 52250 80mm Ultima Zoom is a great pick for digiscopers looking to snag a deal. This model comes with a T-mount adapter, which means that you’ll be good to go for digiscoping as soon as you open the box. It comes with multi-coated optics which help keep the image bright and help reduce the amount of chromatic aberration, which is very important when you’re using a camera. It’s convenient focusing wheel is accessible even when a camera is attached, making it easy to fine-tune any final adjustments you need. The lens is also large at 80-millimeters, which both increases the brightness over smaller lenses and gives you a larger field of view when zoomed in, which can make for stunning pictures. One flaw that wouldn’t matter too much to the casual viewer but will impact the cameraperson a lot is this model’s unbalanced weight. If you don’t have a very sturdy tripod, then you’re going to be constantly readjusting this spotter scope, even before you attach your camera. 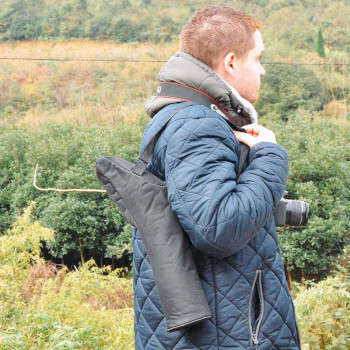 Of course, if you’ve used the camera a lot, you may already have a sturdy tripod, in which case this wouldn’t matter. If you’ve ever wanted to take pictures at extreme zoom, but didn’t have a camera that was up to the task, this is the model that’s for you. 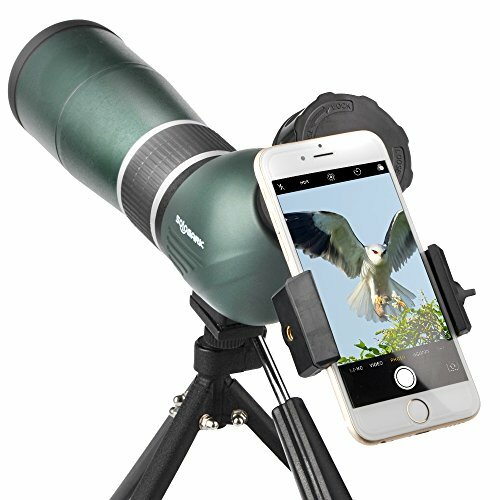 The Landove 20-60×80 comes with a digiscoping adapter that is compatible with most smartphones, which makes it fast and easy to start taking pictures or recording videos with equipment that you already own. So, if you’re looking for something that you can set up fast and that won’t set you back hundreds of dollars for a good camera, you should strongly consider this model. Other important features include the large 80-millimeter lens, which lets in a lot of light and keeps your final images bright and detailed. However, in this instance, the larger lens doesn’t translate to a wider field of view, especially at higher magnification levels. This model also comes with variable magnification, between 20x and 60x which means you can zoom out for a wider field of view, and then zoom in when you want more detail. The Gosky 15-45×60 is our choice for best value for the money. It comes with a cell phone adapter, so like the last model, you can be taking amazing pictures shortly after buying this model, even if you don’t own an awesome camera. Cell phone cameras have improved so much over the years that for they’ll do just fine for most applications. 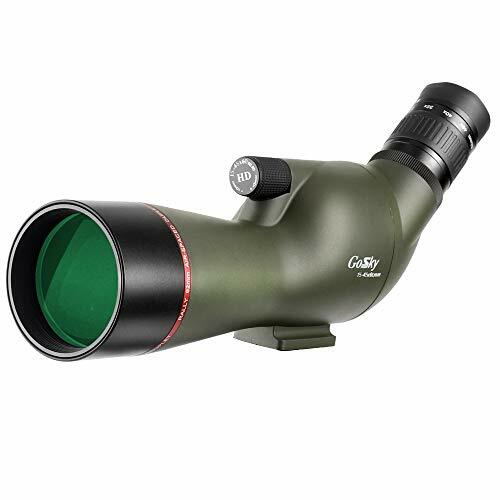 This model also comes with a small tripod, which makes it easy to keep the spotting scope steady while you align the perfect picture. This model comes with variable magnification, ranging from 15x at the close side, to as far out as 45x. However, the magnification wheel is in a bit of a tricky place on this model, and it can be hard to get to when you have your cell phone adapter attached to the frame. However, this model is far cheaper than the models before it on this list, so if you’re looking for a great deal and don’t mind some minor inconveniences, then this is the model for you. Sometimes you may think that you’ve found a deal on a model, but it turns out that instead of being a good value buy, you ended up with a piece of junk instead. That’s likely to be your experience if you buy the SOLOMARK 15-45×60. It does have some of the upsides that you’d find on more expensive models, such as adjustable magnification and an included cell phone adapter. However, that cellphone adapter doesn’t work well, especially if you have a larger smartphone, which means that a lot of people are going to be out of luck. To make matters worse, it’s not that great of a spotting scope. It has come flaws common to cheap models, including the classic hallmarks: fuzzy and dark images, especially when the magnification is higher. Since this model’s magnification range starts lower and doesn’t go that high, this is doubly disappointing. It also has chromatic aberration problems which make a fuzzy and dark image even worse. You’re going to have to spend a bit more money if you want to get a model that can make good digiscoping pictures. 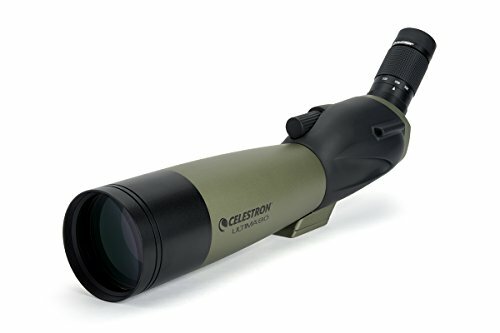 The Celestron 52250 80mm Ultima Zoom is the best model overall, but also the best model for people who already own a high-quality camera and want to make their photography that much better. The Landove 20-60×80 is a great model for people who have a cell phone with a good camera, due to its included cell phone mount. The Gosky 15-45×60 is the best value, due to its included tripod, cell phone adapter, and low price. The SOLOMARK 15-45×60 also comes with a cell phone adapter, but it doesn’t produce good images, which makes it poor value and dooms it to the bottom of our list. 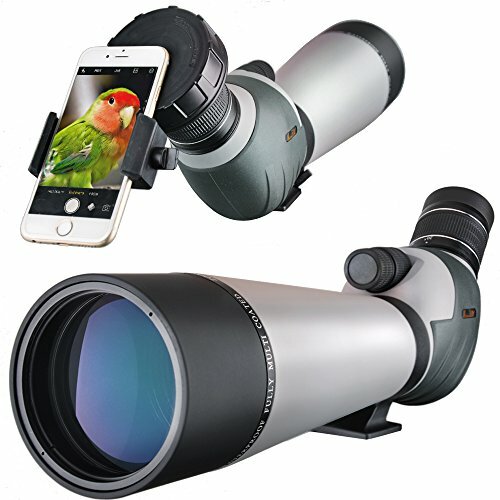 We wrote our reviews with you in mind, so we hope that they have helped you gain an idea of what kinds of spotting scopes are great for digiscoping. With that information in mind, you should now be able to find the model that works best for you.